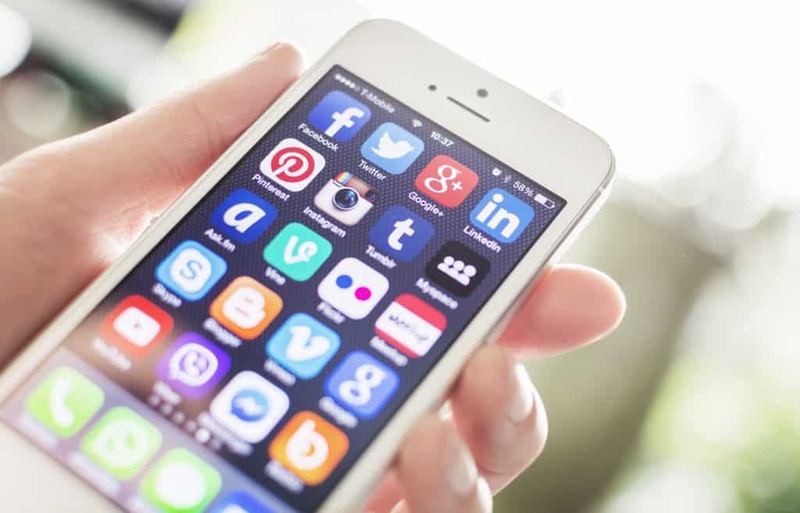 Figuring out what to post on social media can be a daunting and time-consuming task. Social media post ideas are one of those things that seem easy, but when you sit down to post it suddenly becomes very difficult and can feel overwhelming. If you’ve ever struggled with what to post on social media or you’ve felt uninspired and desperate for a fresh idea of what to post on social media, you’re in luck! 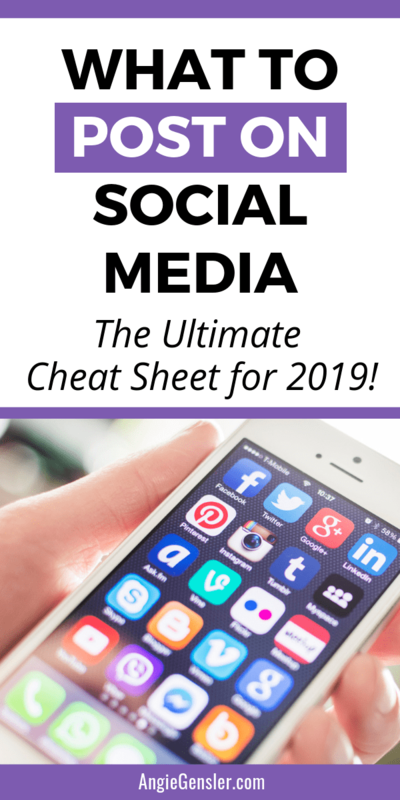 I’ve created the ultimate list of what to post on social media. 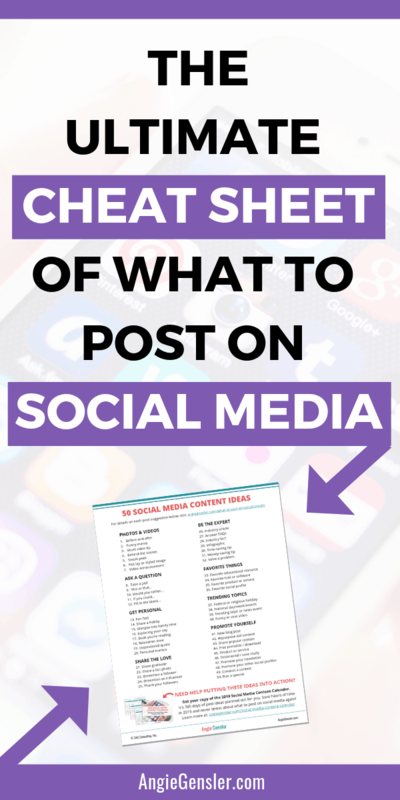 This list is complete with 50 content ideas of what to post on social media. I’ve even created a free cheat sheet you can download and keep next to your computer. No more excuses – you always have a fresh idea right at your fingertips. 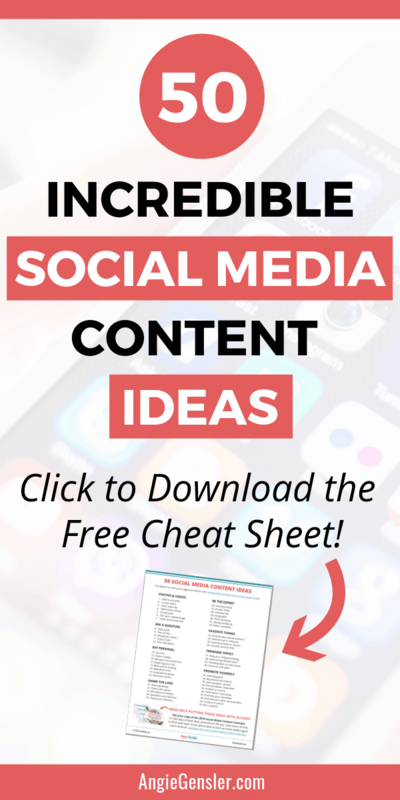 These content ideas will work great on all of your traditional social media channels – Instagram, Facebook, Twitter, and LinkedIn. With that said, I strongly recommend you focus your time and energy to just one channel and use an automation tool like IFTTT or Zapier to automatically share your posts to your other channels. To learn more about IFTTT and scheduling social media content read: How to Schedule Social Media Content Like a Boss Without Spending a Dime. If you’re struggling to figure out which social media channel makes the most sense for your business, I highly recommend you narrow your options down to either Instagram or LinkedIn. Unfortunately, Twitter and Facebook have become extremely difficult to gain new followers and organically reach your followers. 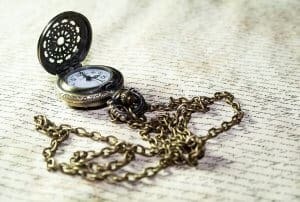 Instagram and LinkedIn both have some outstanding features that allow you to find and reach your ideal audience, making them a better use of your time. 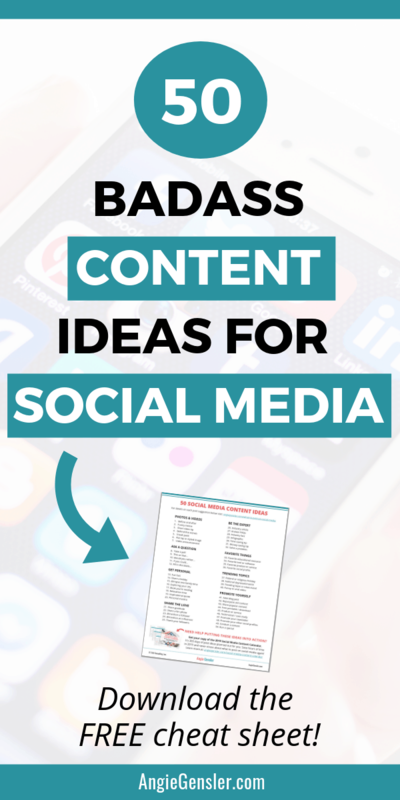 The 50 social media post ideas will work for any type of business. Whether you’re a Realtor posting on LinkedIn or you’re a mommy blogger posting on Instagram, this list of ideas will work for your business. 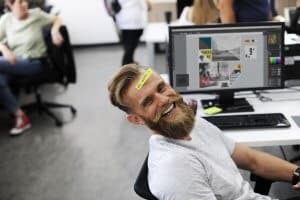 Obviously, you’ll need to customize the content to fit your business and your ideal audience, but nearly all of the ideas in the list below can be adapted for your unique business. Before you dig into the list of post ideas, keep in mind that you want to post a wide variety of content on social media. For example, you don’t want to promote your blog content five days in a row or share nothing but quotes for weeks on end. Your feed will become a snooze-fest, so be sure to mix up the type of content you’re sharing. You also want to be consistent and make daily posts and, depending on the social media channel, make multiple posts per day. Unfortunately, consistency can be next to impossible for busy entrepreneurs and small business owners. The best way to ensure you’re posting fresh new content on social media on a consistent basis is to use a content calendar. I’ve been using a content calendar for over 5 years and I can’t praise the benefits enough. Before using a content calendar, managing my social media channels and coming up with post ideas was like pulling teeth. It always left me feeling overwhelmed and inadequate. I could never shake that “I’m failing at this” feeling. Plus, my posts were uninspired and sporadic and I wasn’t getting the results I wanted from my social media marketing efforts. Once I started using a content calendar, my entire process was completely transformed. The calendar sparked new ideas every single day and I was finally able to post content on a consistent basis. Between my consistency and the improved quality of my posts, I finally began to see engagement and growth! If you’re interested in using a content calendar as well, click here to get your copy of the 2019 Social Media Content Calendar. I’ve broken the 50 social media content ideas out into eight different categories to make it easier for you to mix up your content. Unless you’ve been living under a rock, you know that photos and videos increase engagement on social media. Here are seven photo and video ideas to get you thinking outside the box. Everyone loves a good transformation! Your before and after photos can be as simple as cleaning up your desk or as elaborate as sharing your weight loss journey. Just make sure the before and after photos you share are related to your niche. If you blog about marketing, don’t share before and after photos from cleaning out your refrigerator. Instead, share before and after photos of your office or your scrum board. Who doesn’t love a good meme? Try to share a meme that relates to common problems experienced by your audience, not necessarily by you. If you blog about Yoga, share memes related to everyday struggles with finding balance and pursuing a healthy lifestyle. 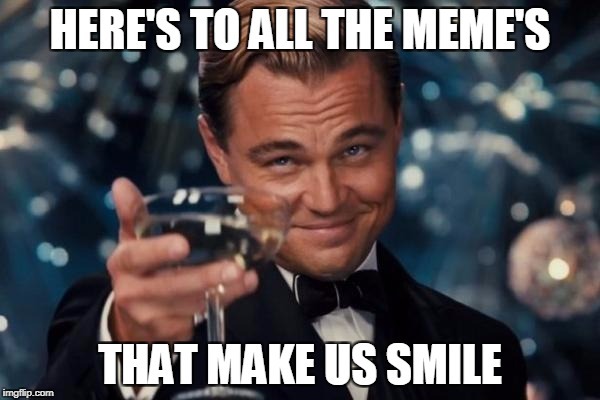 To create free meme’s like the one below visit: https://imgflip.com/memegenerator. Overcome your fears of perfection and turn one of your quick tips into a short video. 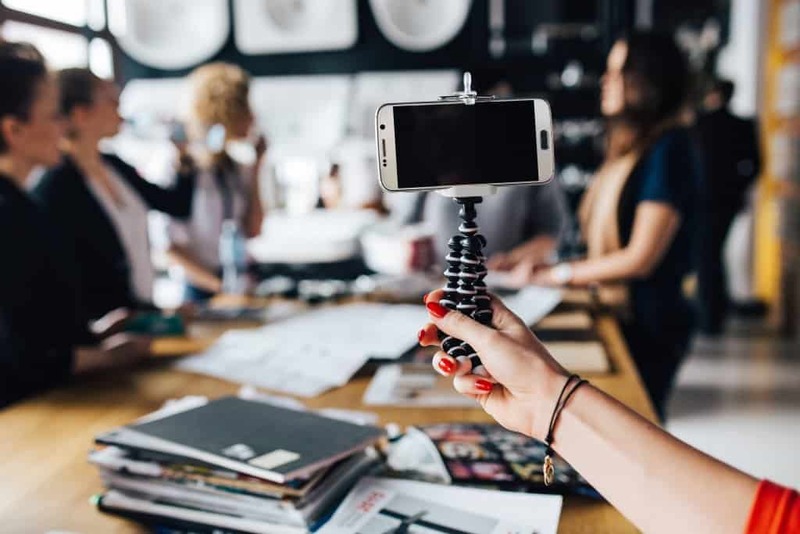 Video content is king right now and video posts see more engagement than any other type of post. Take things one step further and go live on Facebook or create an Instagram story. These platforms are pushing live content so your video will be seen by more people if you go live. Share a photo or video of you hard at work. This could be in your office, on location for a project, or at a tradeshow or special event. Give your audience a sneak peek at what you’re working on. Share a screenshot of your computer, take a photo of a new craft or recipe you’re creating, record a short video touring the home you’re about to list, or create an Instagram story sharing updates from the conference you’re attending. Create a sense of excitement for what’s to come! The flat lay is huge on Instagram and you can flat lay anything – it’s not just for food and fashion. It’s as simple as arranging some items on a flat surface and taking a photograph of them straight from above. Here is an example of a “business-related” flat lay. Get creative with your flat-lay images. If you’re a real estate agent, flat lay the tray of cookies and your business cards in the home you’re showing. If you’re a chiropractor, flat lay your top selling supplements or essential oils. Go live on Facebook or create an Instagram story announcing the release of something you’ve been working on. This can be as simple as announcing a new blog post you just published or as extravagant as a new product launch. Don’t have time to design images for your social media posts? Grab these 150 Social Media Image Templates. They are ready to post as-is OR they can be customized to match your brand identity! 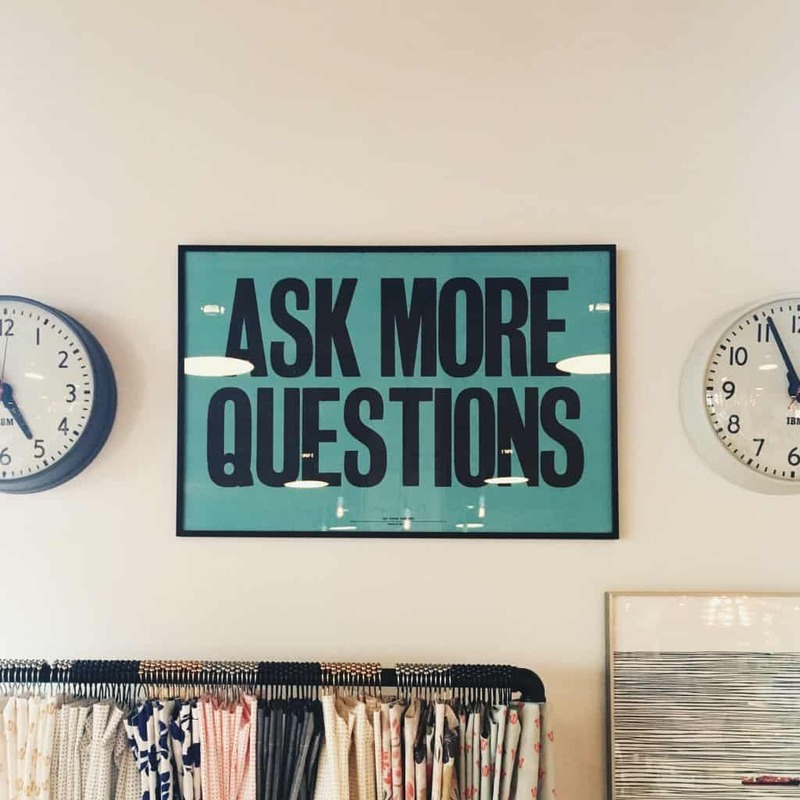 Asking questions is an outstanding way to increase engagement on your social media profiles. It also helps you separate your true followers from the bots and allows you to interact with them. Below are just a few suggestions for the type of questions you can ask. For a complete list of 65 questions to ask on social media read: 65 Social Media Questions to Increase Engagement. Test new ideas with your audience. For example, “I’m thinking of creating a new e-book. Then list 4 or 5 options for your audience to choose from. Facebook has a polling feature you can use when making a status update and Instagram has a polling feature within Stories. In my experience, “This or that” questions generate the most engagement. They are simple to answer and tend to invoke a lot of passion. The key to this or that questions is to keep them simple. You don’t need a long introduction, just simply list two items and let the debate unfold. A few examples are: tea or coffee, Pepsi or Coke, salty snack or sweet treat. Watch your engagement skyrocket when you present your audience with a “would you rather” question. For example, would you rather have free Starbucks for a year or free iTunes for a lifetime? “If you could” questions are a lot of fun and you can get really creative with what you ask. For example, if you could eat only one thing for the rest of your life, what would it be? Fill in the blank questions ask your audience to fill in the blank to a statement you provide. These are great questions to tailor specifically to your niche and generate engagement. Your social media followers want to get to know you on a deeper level. They want a glimpse of your personal life and a taste of your personality. Getting personal works best on Instagram and Facebook. LinkedIn is becoming more personal, but it continues to remain a professional network so be mindful of the type and level of personal information you share. Instead, you could share “personal” information about your company. 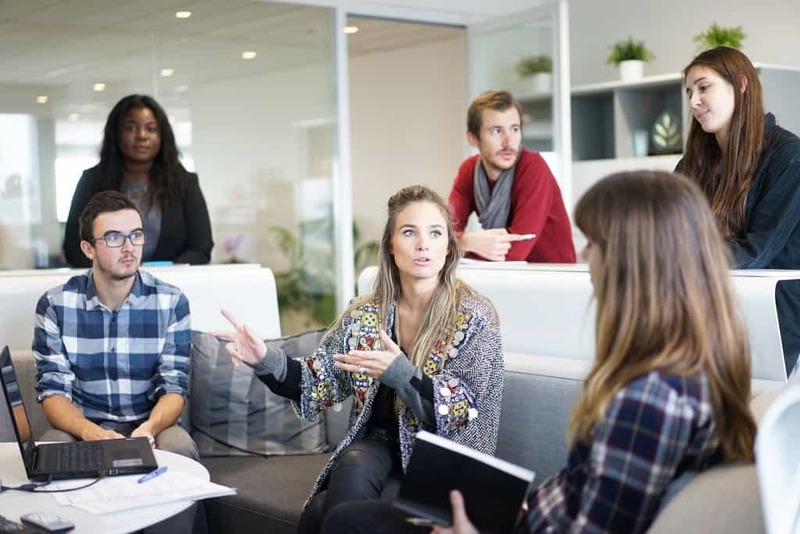 For example, you could share a fun fact about your company history or a photo of your employees enjoying the annual company picnic. Share a fun fact about you that not everyone knows and allows your audience to get to know you better. Share a photo or video of you engaging in one of your hobbies or favorite activities. If you’re posting on behalf of a company, share a photo of the employees taking a break or having fun together. More than likely, your family is the most important part of your life so share that with your audience! Just be mindful not to post any photos that indicate where you live or where you are, such as street signs or the name of your kids’ school. If you’re out and about exploring your city, whether it’s in nature or an urban area, share it! Tag your city in the photo to get more reach and followers. Let your audience in on what you’re currently reading or learning. 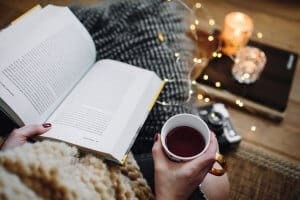 Whether it’s a fiction novel, a nonfiction self-help book, an educational resource or online course, your audience wants to know what you’re reading in your free time. Bonus points if you include key takeaways and a link for your followers to get their own copy. Human beings are curious creatures. Not only do your followers want to learn your expert tips and secrets, but they also want to know how and where you unwind after a long day. Not to mention, seeing a photo of you relaxing by a fire or drinking wine in front of the TV inspires your audience to also take time to relax. Quotes tend to get a lot of engagement on social media. Share one of your favorite inspiring quotes. You can style quotes on a beautiful photo or a plain colored background using a design tool like Canva.com or apps like Textgram. Unfortunately, designing images consumes a lot of time. If your time is limited, a great solution is to purchase pre-designed image templates of quotes styled in beautiful fonts. 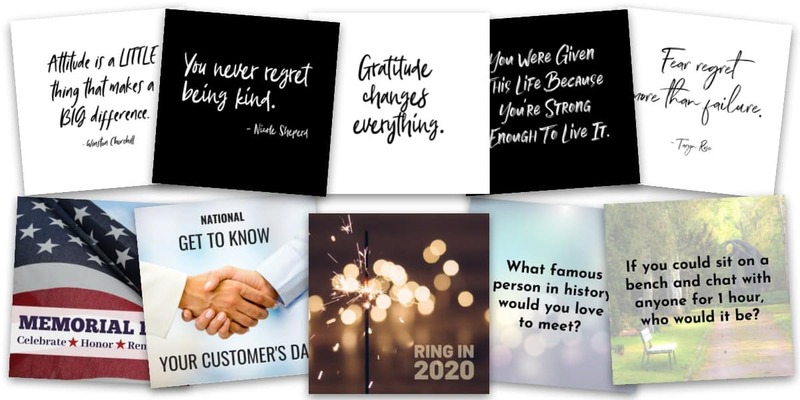 These 150 Social Media Image Templates include 52 inspiring quote images that can be customized with your logo and brand colors. Do you have a mantra or affirmations you say to keep you motivated to accomplish your goals? Share them with your audience! If you represent a company, share the company values. I often share this mantra with my audience to offer a reminder that success takes time and hard work. In fact, I even wrote a blog post about this. Read: 10 Reason Perseverance, Not Perfection, is the Key to Success on Social Media. The number one complaint with social media is the massive amount of negativity and complaining that takes place. Additionally, it’s easy to become consumed with the “me, me, me” mentality or get sucked into the comparison trap. Thankfully, you can choose to be different. Be a source of positivity, love, and gratitude and remember to focus on others. 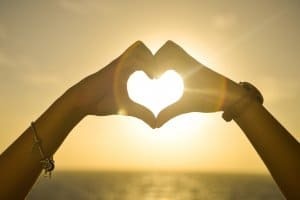 Share something or someone you’re grateful for or share a photo of something that brings you happiness. Take a look at your fans and their social profiles. You’ll be amazed at the wonderful content they’re sharing. Find a gorgeous, funny or inspiring photo and share it with your audience. Just be sure to give them credit and tag them in the photo. Do you have a follower who engages regularly with your content? Give them a shout out using an @mention and thank them. They will feel so special and be grateful for the social media attention. Is there an influencer in your niche that you’d like to develop a relationship with? @mention them in a post and share something you’ve learned from them or promote one of their products or services. @mentions on social media are a great way to get the attention of someone you wouldn’t otherwise be able to reach. A simple thank you goes a long way. Don’t forget to thank you audience from time-to-time and share your genuine appreciation. People like to follow social media accounts that provide them with value. You can provide value by being the expert and sharing actionable tips and advice. If you’re not sharing a video tip, be sure to include a photo that will catch the reader’s eye and entice them to read, like, comment or share your post. Share an educational or informative article related to your niche topic or industry. Answer a question you tend to get asked a lot. If you’ve recently received a handful of emails or direct messages, most likely there are more people in your audience who will benefit from the answer. Share a fun fact about your industry or niche. This can be as simple as a quote from a great article. Be sure to include the link! Who doesn’t love a good infographic? They tend to rack up more engagement and shares than other images. Share an infographic with helpful tips or information for your audience. Share a tip that will help your audience be more efficient and save time. These tips are also called “hacks” and they are very popular right now. For example, if you have a parenting blog, share your hack on how to quickly prepare a week’s worth of school lunches. Share a tip or “hack” that will help your audience save money. Have you discovered a simple solution to solve a problem you’ve experienced? Chances are your audience has the same problem. Solve their problem and share your solution! via GIPHYNo, I’m not suggesting you play Oprah and give away a car to all of your followers. Although that would be pretty great! I’m suggesting you give away your “secrets” to your audience and share your favorite things related to your niche. What’s your favorite book or course related to your niche? Include the link for your audience to access or buy it and include a few takeaways or lessons you learned. Is there a tool or resource you can’t live without to do your job or run your business? Share it with your audience! Don’t forget to check if you can earn some affiliate cash by sharing that tool. 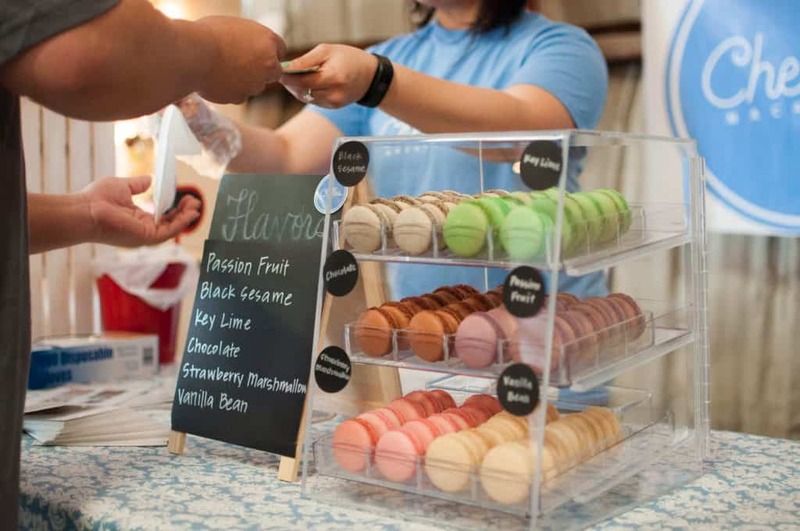 Share a product or service you love and your audience will benefit from. Keep in mind, this is not your own product or service. That comes later, so keep reading. Who inspires and motivates you? Who is your go-to source for information? Chances are your audience will love them as well. Share your favorite blogger, influencer or social profile. Timely topics are more difficult to automate and schedule in advance. You can plan for holidays and recurring annual events, but you can’t plan for significant news events, trending topics, or viral videos. When you plan your social media content, be sure to leave room to post about unforeseen news and events as they occur. Holidays are easy to plan for, but be mindful of your audience. If the majority of your followers live in the United States, stick with United States holidays. A quick Google search will direct you to resources with the dates of holidays recognized by your country or religion. 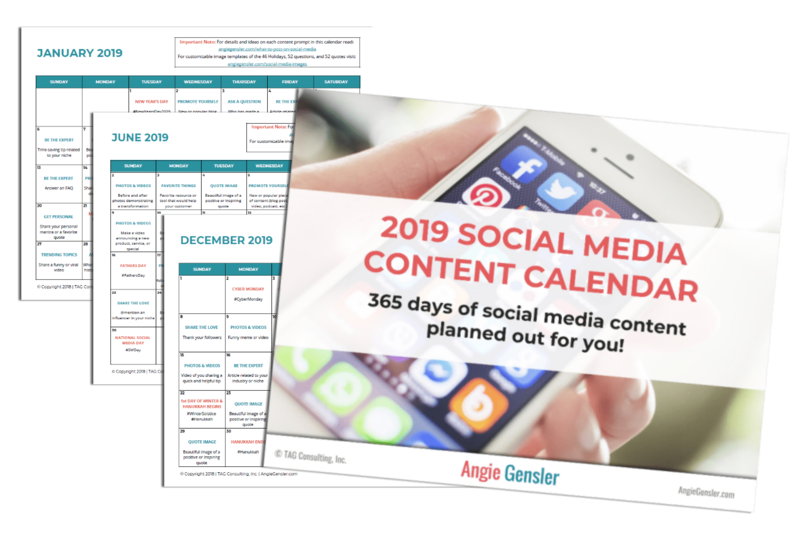 Or, you can grab a copy of my 2019 Social Media Content Calendar. The calendar is 365 days of social media post ideas planned out for you, including 46 U.S. holidays and national days that are perfect to celebrate on social media. Think, National Breast Cancer Awareness Month, Nurses Week or National Chocolate Day. This site is a treasure trove of fun days to celebrate. No matter your niche, you can find a day to celebrate. Did you know there is a National Personal Chef’s Day, a National Lash Day, and a National Crayon Day? And those don’t even scratch the surface of the completely strange days. There’s a National Shower with a Friend Day! For a list of holidays that are perfect to celebrate on social media read: The Complete Calendar of Social Media Holidays for 2019. Is there a major news event everyone is talking about? Share your thoughts on it or share an article with an interesting perspective. Just be mindful not to hitch your wagon to heated political or religious news events that are unrelated to your niche. Luckily, you don’t have to get involved in polarizing topics to take advantage of trending news. Remember the white and gold or blue and black dress debacle? Be creative and take advantage of trending topics and hashtags to grow your audience. Jump on YouTube and see what videos are trending. Make sure to include a teaser in your description that entices your audience to watch the video. If you’re not promoting yourself then why are you bothering with social media? It’s important to promote yourself, but you don’t want your entire feed filled with promotional content. That’s the quickest way to get unfollowed. Most experts recommend following the 80/20 rule. Meaning, only 20% of your social media posts are promoting your own content, products or services. Notice how I placed this section at the end and it comprises 20% of the 50 social media post ideas? There’s a method to my madness! Share your latest blog post. Give your audience a teaser of what they’ll learn or what problem you’re solving in the post. Dust off an old blog post and update the images and headline – then share it with your audience. Take a look at the analytics from your website and social channels to identify your most popular content. Chances are a large percent of your audience have never seen it. Share a worksheet, checklist, cheat sheet or other printable your audience can download for free from your website. Drive traffic to your website and watch the subscribers pour in! Share one of your products or services. Tell a story about how it solves a problem, saves time, or saves money for your ideal customer. Don’t forget to include a link to a conversion-optimized landing page. Share a quote, case study or video from a satisfied customer. Give your audience some social proof to what you’re trying to sell. Let your audience know what special information or goodies your newsletter subscribers get and encourage your audience to subscribe. Hopefully, you’re not sharing the exact same thing on all your social channels. If that’s the case, let your audience know what new gems they’ll discover by connecting with you on your other channels. Encourage your audience to share your content with others. Track this by creating a unique hashtag, For example, for my weekly live Facebook show, I could ask viewers to share a post about it on social media using the hashtag #FreedomFriday. I can easily run a search for that hashtag on the platform and everyone who shared a post will be entered into the contest. If you’re selling a product or service, run a special. You don’t need an excuse to run specials, but it can help to run them around holidays. Think outside the box and beyond the obvious holidays like Black Friday. You can run a special simply because it’s National Hugging Day (January 21st). Now that you know what to post, it’s time to learn how to post. If you’re not taking advantage of social media scheduling tools you’re wasting hours of time each week. I’ve used many social media management tools throughout my marketing career and entrepreneurial pursuits. In my experience, simple is better. It’s not necessary to use the $100 per month tool with every bell and whistle imaginable. In fact, you can actually create a great process using completely free automation tools! 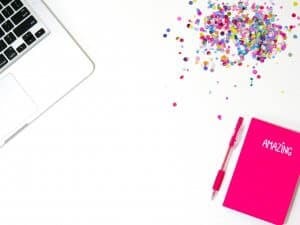 To learn how to get started with free social media scheduling tools read: How to Schedule Social Media Posts Like a Boss Without Spending a Dime. If you found this post helpful, please leave a comment below and let me know! It would mean the world to me.